Ask your family veterinarian to talk about what he or she has found inside the stomachs of dogs and you will be in for an afternoon of stories. For a variety of reasons, our canine pets seem to enjoy gobbling up the oddest things! Recently, a leading manufacturer of veterinary x-ray products held a contest to find the oddest objects. Some of the winners included another Labrador with 14 golf balls in his stomach, a Boxer with 208 rocks of various sizes, a Pit Bull puppy who swallowed an 11 inch steak knife, and a Pug with expensive taste. 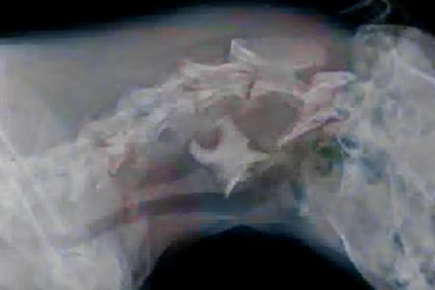 The 7-month old pup had swallowed his owner's 2-carat diamond ring! The winner of the dog category though went to the Samoyed who had 8 batteries of differing sizes, from a "D" cell all the way down to AAA, a plastic raccoon, 7 rocks, a marble, 2 broken light bulbs, machine parts, and a variety of staples. Many of these pictures can be seen below. Most amazingly, from the follow up reports, everyone of these pets has done fine and most left their veterinarian's hospital the next day wagging their tails and anxious to head home. What perplexes many owners, and many veterinarians, is why the dogs are eating these objects in the first place. Some items can be obvious, for example, pieces of glass from a broken spaghetti sauce jar could easily end up in the abdomen of a dog hurrying to finish off the tasty treat. Others, such as the sticks and rocks, are less obvious as to why they were eaten and even more curious is how many of these dogs swallow items without damaging themselves and why they continue the habit. Keep all garbage behind a secure door or cabinet. Use baby gates or closed doors to create "off-limits" areas for your dog. Monitor your dog while walking. Many pets will find irresistible treats, such as corn cobs and walnuts, while enjoying the day in the park. Being proactive and picking up leftover food, utensils, and other items after eating can help to curb the dog's desire as well. While some of the pictures in this article are amusing and the stories have all ended happily, it is important to remember that these pets underwent painful surgeries. Their owners likely suffered anguish and worry as their dogs were at the veterinary hospital and the retrieval of these items likely cost more than $1000 at each occurrence.